At St Thomas' CE Primary School the’ Learning Challenge’ approach is used as a structure and ethos for our curriculum design. It makes use of the national curriculum 2014 and individual subject skill progressions to ensure our children are taught a broad range of skills across subjects. The Learning Challenge concept is built around the principle of greater children’s involvement with the work. The concept requires deep thinking and encourages learners to work using a question as the starting point. In designing the curriculum our class teachers and children use a prime learning challenge, expressed as a question, as the starting point. Engagement in learning is encouraged through a ‘Wow’ moment - a starting lesson that sparks curiosity. Pre-learning tasks ensure that learners are directly involved in the planning process. Well planned pre-learning tasks help to bring out what the children already know; what misconceptions they may have and what really interests them. Using information gained from pre- learning tasks using Mind Maps, KWL grids etc and the school’s context, a series of subsidiary challenges are then planned. Each subsidiary learning challenge is also expressed as a question. The subsidiary learning challenge is normally expected to last for one week. We ensure the Learning challenges make sense to the children and it is something that is within their immediate understanding. Continuity and progression in the curriculum is then built around a set of objectives known as Key Learning Goals which are the key skills within subject disciplines. These are broken into year group expectations and displayed and monitored in books. The Key Learning Goals allow us to guarantee that our children’s essential skills are being developed. In addition to the relevant skills to be taught, opportunities are identified for English (reading, writing and oracy), Maths and Computing. These are weaved throughout each Learning Challenge to ensure all children know the audience and/or purpose for their work and are using Computing to research and/or present their work. In addition to this opportunities for learning outside the classroom are planned for as much as possible. Time for children to reflect or review their learning is central and a clearly defined exit point or period of reflection is planned. This is in keeping with the ‘Learning to Learn’ principle where reflection is seen as a very important part of individuals’ learning programmes. Within the Learning Challenge Curriculum it is suggested that the final subsidiary learning challenge is handed over for children to reflect on their learning. Children present their learning back to the rest of the class or another appropriate audience making the most of their oracy and computing skills to do so. This might be through an whole school exhibition of work, an assembly, a musical performance or a Curriculum Bonanza which parents and Governors are invited to. Across the year Learning Challenges are undertaken, each focusing on a subject from either Art, Music, D&T, Science, History or Geography with a view to also including local, national or global events. National and global events are discussed weekly through Espresso News Bites and First News. Throughout the school the children are taught to play instruments such as ocarinas, recorders, violins and glockenspiels. Year six form a samba band and perform at our end of school Mela event which celebrates music and dance form different cultures and eras. Whilst the Learning Challenge approach aims to tie subjects together under the Learning Challenge question, it may be necessary to teach some subjects as discrete subjects. Some subjects may also lend themselves to being taught in extended blocks. Theme weeks are taught at St Thomas' examples include Art Week and DT week which conclude with an exhibition of the children's work which parents are invited to. The Life Caravan visits the school during Health Week and parents are invited to attend healthy eating workshops. During Enterprise Week classes plan projects working within a budget. Book Week involves parents visiting classes and taking part in lessons each class produces a book which is displayed at the end of the week. We also have a book fair and a character dress up day which involves a carousel of stories and activities across school. Religious theme weeks linked to festivals from different cultures take place at Christmas, Eid and Easter. 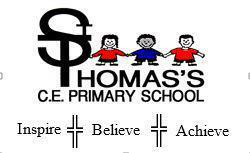 RE at St Thomas's CE Primary School will also be taught weekly, in addition to French at KS2. For more in depth detail of what is going on in each class and how you can help please see the relevant class page.